The Michelin Guide has been a barometer of haute cuisine in modern times. When the Michelin brothers began publishing this guide in 1900, cars were rapidly changing the landscapes of the western world. The little red book soon became the authority for discerning foodies in France and other European countries who could now reach acclaimed eating places out of town. Chefs reached highs and lows of their careers as they were awarded Michelin stars or had their stars taken away. Michelin began covering New York City and the Bay Area a few years back. In the recently released 2010 guide, a new reciepient of the Michelin star is Luce. Luce (pronounced Loo-chay) is located within the Intercontinental Hotel in the SoMa area of San Francisco. Chef Dominique Crenn draws inspiration from contemporary French and Asian cuisine and blends them with local flavors. The decor is simple and elegant with high ceilings and polished surfaces. 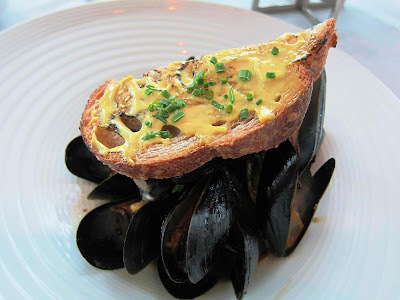 I began with a stack of Casco Bay Bouchot Mussels in lobster broth. A slice of sourdough with rouille was placed on top of the stack. The gleaming black mussels made for a pretty sight! The garlic and olive-oil tastes from the rouille combined perfectly with the flavors of lobster as I soaked my bread into the goodness of the broth between nibbles of mussel. Elaborate food arrangements were practiced as early as the middle ages. Kings and nobles were often presented with extravagent creations such as pies baked with live blackbirds (remember that old nursery rhyme: Sing a song of sixpence? ), beautiful specimen of peacock and swan with their feathers still intact but stuffed with meat, dry fruit and spices. You can see scenes depicting this in the TV serial on the life of Henry VIII, The Tudors. My main course was in front of me now. The Branzini is a Mediterranean sea-bass. 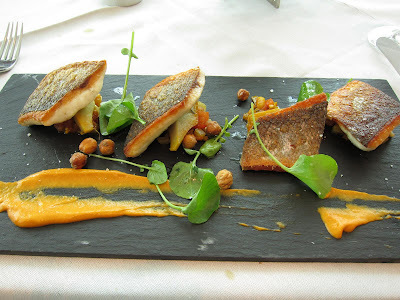 The Branzini in front of me was an exquisite presentation on a dark slab of wood, with artichokes Provencale, sauce Romesco, roasted chickpeas and chaat masala. 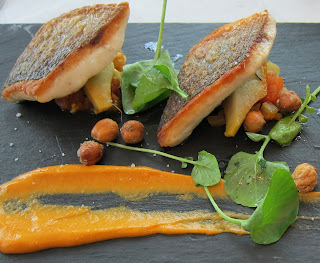 The fish was fried very like we do in Bengal and the chickpeas and chaat masala gave it a distinct Indian twist. The taste of olive oil, garlic and peppers in the sauce blended well with the flavors of the fish. Incidentally, British experimental chef Heston Blumenthal attempted to recreate the blackbird pie for his TV series. Upon discovering that blackbirds were a protected species in the UK, he switched the recipe to pigeon. The pie and pie lid were cooked separately and allowed to cool. The live pigeons were inserted only moments before presentation. Initial attempts resulted in the pigeons refusing to fly out. This was solved by using trained homing pigeons to fly to their cages suspended in the ceiling, whereupon they defecated on the celebrity diners beneath. 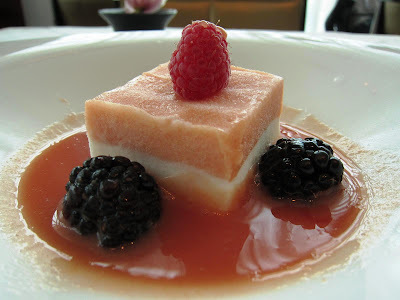 I ended my lunch at Luce with an exotic dessert, a coconut-guave parfait. This one was a winner too! The combination of guava and coconut was fantastic. This restaurant certainly deserves its reputation. The service is efficient and the atmosphere casual. 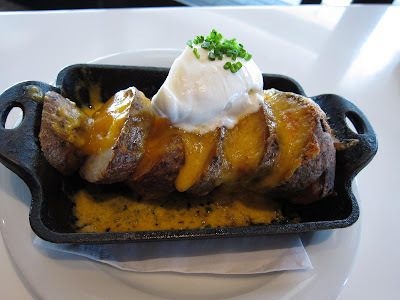 The highlights are clearly the food and presentation, commonly categorized as New American cuisine. As vegetables and fresh ingredients finally became fashionable again in America in the late 90s, and immigrants from Asian and Latin American influences . Californian cuisine became synonymous with fresh and organic vegetables and meat sourced from farmers' markets with a strong attention to presentation. Jerimiah Towers, and Alice Waters of Chez Panisse along with Wolfgang Puck are credited to popularizing this cuisine. Chef Dominique Crenn appears to be a worthy addition to the pack of super chefs this region continues to produce. I discovered an interesting place in San Jose's Santana Row. 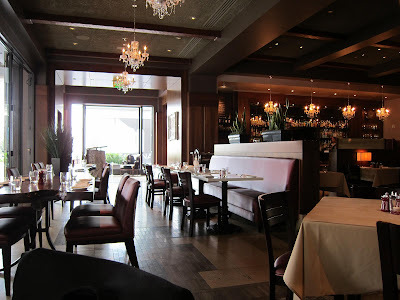 LB Steak is a steakhouse with French inspiration! Combining comfortable and elegant French chic in the heart of Silicon Valley, this is a swankier, hip version of the American steakhouse. The menu ranges from great small plates to impressive steaks with all the sides. 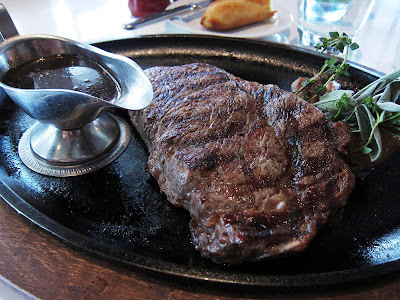 A few of the pictures in this post are of this restaurant and of the 12oz Prime Ribeye I ordered, with green peppercorn sauce and a side of sliced baked potatoes topped with cheese and capers. A meal that celebrates the journey of haute from France to the farthest coast of America. Next in this series: More hauteness in California. Btw, I read about the terrorist attack in your town. How dreadful. I hope everything is alright. Your blog has definitely become "The hitch hickers gastronomous guide" for me and for a lot others I am sure:) really good to travel and taste the cuisines virtually. I so wish I was in California reading these reviews!! The sea bass looks great! What is that dessert you had in the streak house...looks like some sort of a crumble, but can't tell!! Hey!Like someone said how I wish I was reading these reviews live in california!! !bTW went to hard rock cafe last sunday..liked the ambience..food was good too..
@kyh: Yes, it was quite terrible. Almost exactly one week from when it occured. @karthik: Glad you like it. 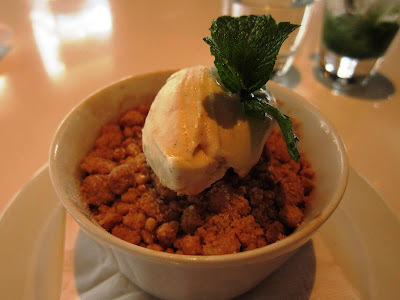 @vamsee: Yes, it was an apple crumble. @Aarti: HRC is a great place during the evening, especially on weekends. Oh my, that fish from CA is extremely mouthwatering! I wish i was there. I lived in the Pacific Northwest (Portland, Oregon) for 20 years and moved back to Pune just last year! Your blog is very nice. Very impressive. Got lots of eatery pointers! Muchas Gracias! @Anil: Welcome to my blog and thank you for your kind comments! @Kajal: Aha, I don't get into a challange with a champ. :) But yes, this is a common question, but thus far I haven't written about the food we make and eat at home. Would be fun don't you think ?